For starters, for all you people out there who don't watch anime you should really get cracka lackin. Some animes I would suggest watching (if you're a newbie) are ones like Attack on Titan, Sword Art Online, Death Note. Now because this is my first anime review, I don't really know where I'm going with this. The story is a horror fantasy story that takes place in modern day Tokyo, which is haunted by mysterious flesh-eating creatures known as ghouls. 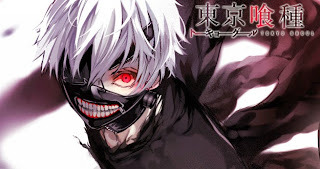 The story follows our main character Ken Kaneki, who likes reading books (that part totally turned me on). One day Kaneki goes on a date with a ghoul only to be attacked within the same day. But as Kaneki is attacked a beam from the building above breaks and crushes the both of them, leaving Kaneki critically injured but killing the ghoul. Kaneki soon receives a transplant from the ghoul, which then leads to him becoming this rare species of half-ghoul and half-human. The rest of the anime follows his brutal transition, as he lives with this strong hunger to feed on human flesh. Art plays a major role in anime. Some are more favorable than others, but I really enjoyed the art in this anime. It was especially dark and gothic for horror and dark fantasy, which I adored. Because this anime was so violent, the artist did a fantastic job at making the scenes realistic and enjoyable. I'm all for the blood and gore! I believe the music featured in this anime was less dubstep and more contemporary. Even the opening theme song was a bit slow. In terms of music, I wouldn't really recommend it for the music. I did like some tracks that were played, but that was pretty much it. I have much respect for music, and it's really important that all animes have awesome music! - The story was well thought out. Awesomely thought out actually. - Fast-paced anime with a lot of violent action scenes. - Blood. Gore. And so much more. - I really liked the art in this anime and how the characters looked. - Theme song wasn't my favorite. - A little too much blood (could be a pro if that's the kind of thing you like). - Fairly new anime so there's gonna be a lot of waiting for the new episodes (there are only 5 episodes so far). I thought the ghoul eyes were freaking awesome! FREAKING FANTABULOUSLY AWESOME! That's one thing I really loved about this anime. The second picture is actually very reminiscent of what the titans looked like in the anime Attack on Titan. These "eyes" sometimes pop out randomly throughout the episodes, so try now to get freaked out when you see it. If you're pretty much interested in watching this anime, here's a little looksie at the trailer.